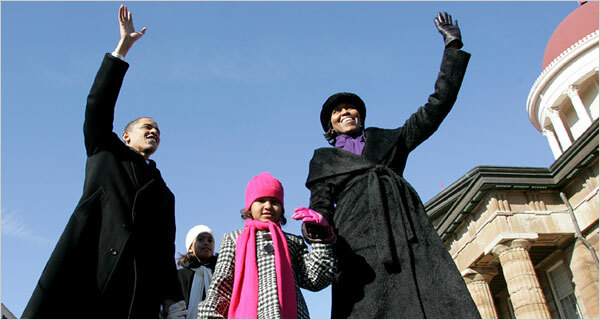 WHEN Barack Obama, his wife and children at his side, announced last year that he was running for president, the Rev. Jeremiah A. Wright Jr. was not there. Mr. Obama had uninvited Rev. Wright from delivering an invocation. LATE Monday night, in the Carolina Inn in Chapel Hill, N.C., Barack Obama’s long, slow fuse burned to an end. Earlier that day he had thumbed through his BlackBerry, reading accounts of the Rev. Jeremiah A. Wright Jr.’s latest explosive comments on race and America. But his remarks to the press this day had amounted to a shrug of frustration. Only in this hotel room, confronted with the televised replay of the combustible pastor, did the candidate realize the full import of the remarks, his aides say. At the same time, aides fielded phone calls and e-mail from uncommitted superdelegates, several demanding that the candidate speak out more forcefully. As Mr. Obama told close friends after watching the replay, he felt dumbfounded, even betrayed, particularly by Mr. Wright’s implication that Mr. Obama was being hypocritical. He could not tolerate that. The next afternoon, Mr. Obama held a news conference and denounced his former pastor’s views as “divisive and destructive,” giving “comfort to those who prey on hate.” And so, with those remarks, a tightly knit relationship finally came apart – Mr. Wright had married Mr. Obama and his wife, Michelle, and baptized their children. Theirs was a long and painful falling out, marked by a degree of mutual incomprehension, friends and aides say. It began at the moment Mr. Obama declared his candidacy, when he abruptly uninvited his pastor from delivering an invocation, injuring the older man’s pride and fueling his anger. Mr. Obama’s campaign has been striking for its discipline. This is a candidate who prides himself on his coolness and singleness of purpose, not to mention his ability to take on opponents as formidable as Senator Hillary Rodham Clinton and her husband, Bill Clinton, the former president. But Mr. Obama discovered one figure who has confounded him, his own pastor. In recent months, the candidate has tried to distance himself from Mr. Wright and his often radical views, even as he felt compelled to understand and explain his former pastor to a larger, predominantly white political world. As for Mr. Wright, he saw a cascade of perceived slights coming from the campaign of a bright young follower whose political ambitions were tugging him away from Trinity United Church of Christ. He saw the church he had founded coming under pressure from reporters and critics, forced to hire security guards. And he made no secret of whom he blamed: Mr. Obama’s political adviser, David Axelrod, a white Chicago political operative. Only a few years ago, the tightness of the bond between Mr. Obama and Mr. Wright was difficult to overstate. Mr. Obama titled his second book, “The Audacity of Hope,” after one of Mr. Wright’s sermons, and his pastor was the first one he thanked when he gained election as a United States senator in 2004. “Let me thank my pastor, Jeremiah A. Wright Jr. of Trinity United Church of Christ,” Mr. Obama said that night, before going on to mention his family and friends. At the same time, as Mr. Obama’s friends and aides now acknowledge, he was aware that, shorn of their South Side Chicago context, the words and cadences of a politically left-wing black minister could have a very problematic echo. So Mr. Obama haltingly distanced himself from his pastor. Mr. Obama announced in early 2007 that he would be running for president. He invited Mr. Wright to deliver the invocation at the event in Springfield, but the evening before the event, Mr. Wright answered his cellphone and heard an apologetic soon-to-be candidate. Rolling Stone had just published a profile of Mr. Obama that included some colorful snippets from the pastor’s sermons. Mr. Obama then asked whether the Rev. Otis Moss III, who would soon succeed Mr. Wright at Trinity, could speak instead. Mr. Wright agreed, even offering to call the younger preacher. (These quotes are drawn from a year-old interview with Mr. Wright; he shared some of his cellphone messages with a reporter). “Actually, we’ve already called him,” Mr. Obama told him. Mr. Moss declined the invitation, and Mr. Wright still went to Springfield, praying with the Obama family privately before the event. Weeks later, Mr. Wright said the blame belonged not to Mr. Obama but to his advisers. He repeatedly mentioned Mr. Axelrod, Mr. Obama’s chief strategist, saying that while he was expert at promoting black candidates with white voters, he did not know much about relating to the black community. The two men nonetheless remained publicly close. A few weeks after Mr. Obama entered the presidential race, he and his wife swept into a private reception and then a gala in honor of Mr. Wright’s 35th anniversary at the church. They were, to all eyes, the favorite children returning to honor the pastor who had married them, dedicated their house and baptized their children. The ladies of Trinity United Church of Christ pressed in on Mr. Obama, as others held aloft cameras and cellphones. Still, the seed of worry had been planted. Blogs, and a few print reporters, kept asking questions about Mr. Wright’s politics, his black liberation theology. Snippets of his fiery, soaring sermons began to appear on cable televisions and in blog posts. “In his sermons, Mr. Wright spoke of Sharpsville and Hiroshima, the callousness of policy makers in the White House and the statehouse,” Mr. Obama wrote. Mr. Obama faced practical political considerations as well. He had made Mr. Wright a central figure in his personal narrative. His embrace of Mr. Wright’s church and its congregants, wealthy and working class and impoverished, formed the climax of his book. It was the moment, in his telling, when Mr. Obama finally pulled every disparate strand of his background together and found his faith. “He had found a truth, a sense of community, people with whom to share the experiences of the day,” said Maya Soetoro Ng, Mr. Obama’s younger half sister, in an interview last year. Mr. Obama’s candidacy would offer the promise of a conciliatory man fluent in the language of the Bible. Here was a candidate who could lead religious voters back into the fold. “We need to take faith seriously not simply to block the religious right but to engage all persons of faith in the larger project of American renewal,” he wrote. His grounding in Trinity Church would also bequeath to him a measure of authenticity with the black community. But by March 2008, Mr. Wright’s most outrageous sermons had nested on cable television, replayed on an endless loop on news channels. The two men rarely, if ever, talked anymore, and Mr. Obama increasingly found himself asked to explain and excuse away Mr. Wright’s most elaborate accusations. Aides say that they and the candidate came to feel that they had no control over the pastor, no sense of what next he might do or say. At the church, as well, the presidential campaign had placed a congregation under a microscope. Trinity, of late, took up a collection – the Resurrection Fund – to pay expenses like security guards and public relations. Some reporters began covertly taping services, and others took to calling infirm members whose names are listed each week in the church bulletin, pressing even those in hospice care for details about Mr. Wright. Mr. Wright was on a long-planned cruise about this time; he returned to find his name a term of opprobrium all across the nation. Mr. Obama and his advisers decline to say if they attempted a reconciliation. Mr. Obama himself has acknowledged talking with Mr. Wright after the Philadelphia speech, and people close to both men tried to caution the pastor to remain silent. Mr. Wright, however, wanted only to explain himself. His first steps seemed to go well enough, particularly a relatively temperate interview with Bill Moyers on PBS. But at the National Press Club on Monday, Mr. Wright took a few questions, and his scholarly mien fell away. Mr. Wright seemed to sense nothing wrong. A friend said he appeared buoyant and relieved afterward. But a couple hundred miles south, Mr. Obama was soon seething. The cascade of slights and misunderstandings between spiritual mentor and protégé has halted for now. But if Mr. Obama wins the Democratic nomination, Republicans have signaled, unambiguously, that they intend to resurrect his pastor’s most provocative comments. The question is whether Mr. Wright keeps his peace, or raises his voice.